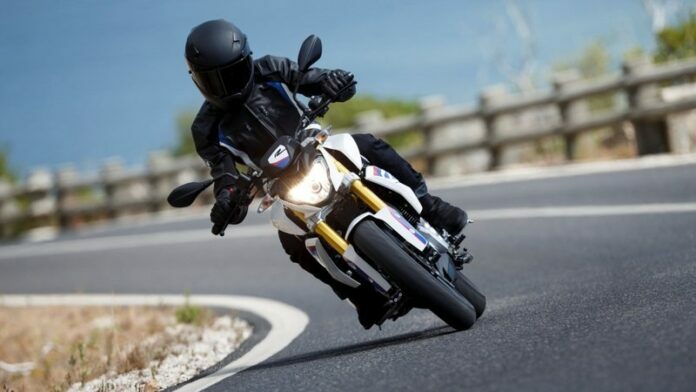 The famous G 310 R roadster by the German manufacturer BMW got a younger brother this year, the adventure-loving G 310 GS. It builds on the proven success of its “R” sibling with several subtle changes, which push the design towards the more adventurous vibe. 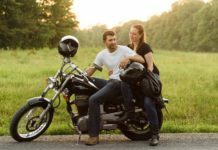 Currently, there is some significant pressure on the market of small-displacement bikes. Major brands wish to fill the void with their own models. Therefore, this important entry-level market is hotly contested nowadays. 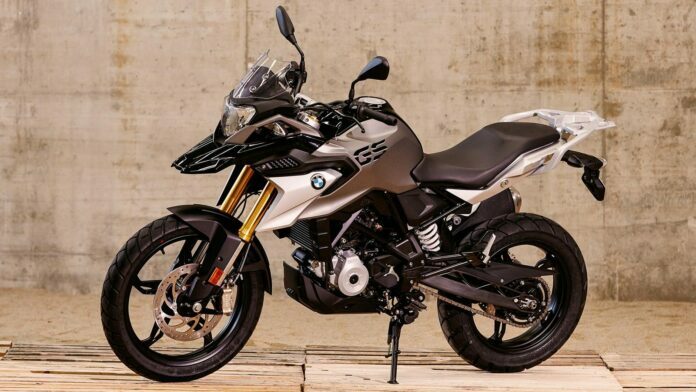 2019 BMW G 310 GS bikes displays have little difference in their respective fly lines, and are quite similar. Their stripped-down naked look is awesome to look at, and they really represent the word “roadster”. Their every part has an important function, while no unnecessary weight or space is there for decorative components. There are a minimal headlight can, and a minimal fender in the front. Its only body paneling are a couple of cheek fairings, serving as the radiator shroud. The beefy tank section becomes a deep-scoop seat, rising again at the pillion. Therefore, this is a typical street bike profile. The most differences between the “R” and “GS” are visible in the front. The “GS” has a 19-inch front wheel, with a fuller fender and a bird’s beak fairing for some extra protection. Above the headlight is a small fly screen, which provides upper-body protection, much less than a proper windscreen would, though. The fairings flow back into the fuel tank and the lines change to a roadster type. The bridge-type frame is made up of tubular steel members, while a bolted-on sub frame is present on the standing structure with a yoke-style swing arm. There is a coil-over shock above its pivot with only the obligatory preload adjustment. Inverted 41 mm forks in the front do not have any adjustments. 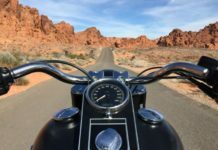 The steering-head geometry is different between the two bikes. With the “R”, it runs with 25.1 degrees of rake, and 4 inches of trail. The “GS” on the other hand gets 26.7 degrees of rake, with 3.8 inches of trail. 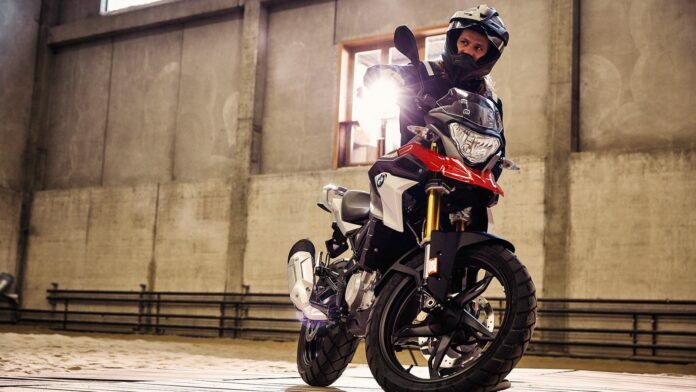 “R” is a naked street bike, while the “GS” is for rough backroads and light off-road terrain. 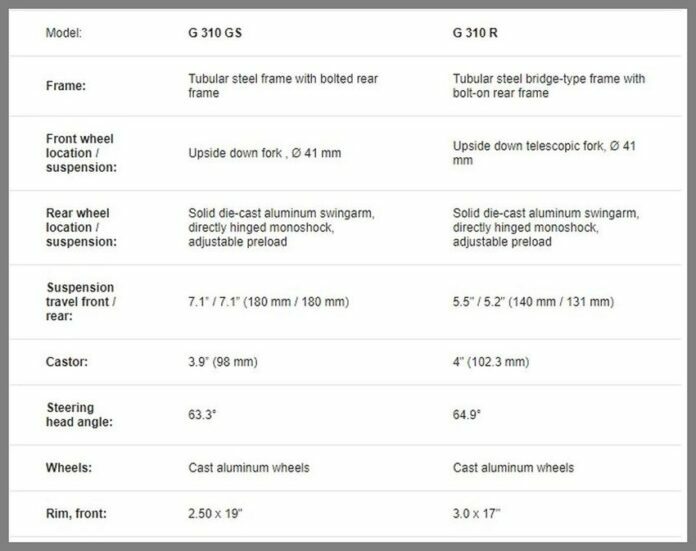 Since this is the case, the same suspension at 5.5 inches in the front and 5.2 inches in the back is surprising. When it comes to braking, they are consistent with opposed-piston, four-pot caliper for the single 300 mm disc in the front, and a piston-and-anvil caliper for the 240 mm disc in the back. BMW’s ABS prevents the loss of traction when over braking. The power plant in this bike is the 310 thumper by BMW. This single cylinder engine is in the rear, lowering the center of gravity and moving it forward a bit. 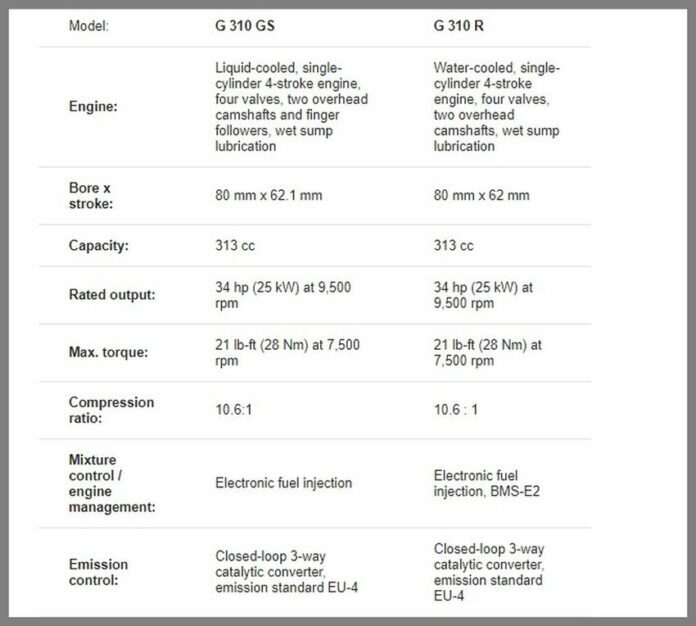 With an 80 mm bore and 62 mm stroke, the engine gives 313 cc. It has an impressive mileage of 71 mpg, while the top speed is 90 mph. More importantly, it produces 34 horsepower at 9,500 rpm, with 21-pound-feet of torque coming on at 7,500 rpm. You can see the quality of the BMW engine all over the beautiful piece of machinery. However, there is escaping the one-lung vibration, so prepare for it even when it is muted. 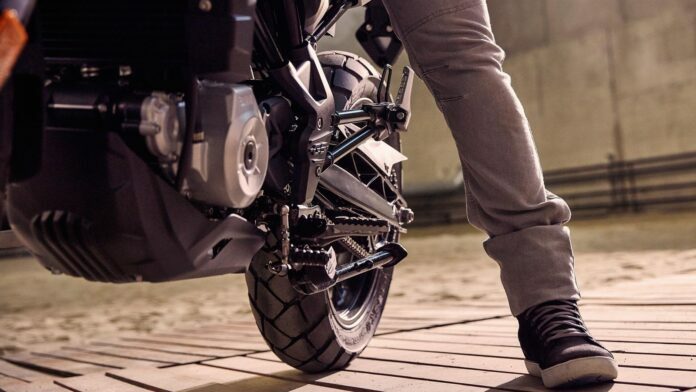 The clutch is multi-disc wet and it gives six speeds and a constant-mesh transmission. The vanilla suspension is a great touch for this bike, but there is no slip-and-assist clutch on the “R” model. 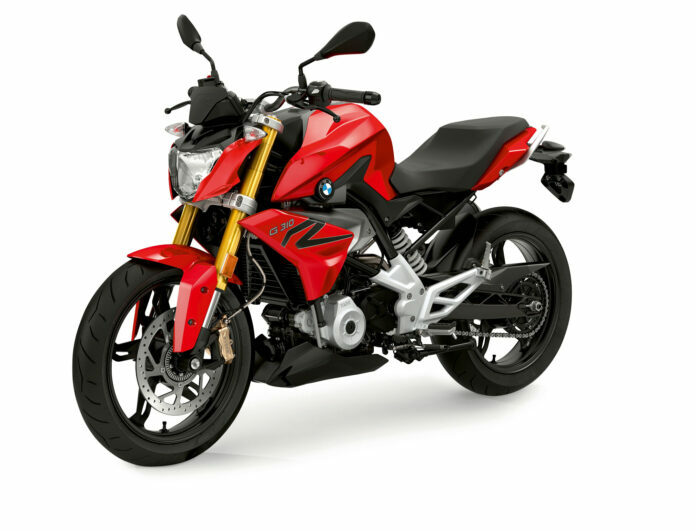 When it comes to spending bucks, since it is going to be an entry-level piece, the G 310 GS starts at $5,695, while the older G 310 R has a lower price tag of $4,750. Over the years, the small-displacement market has been gaining popularity. 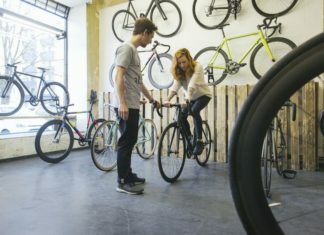 In addition, adventure-bike market is also shaping up rather nicely. 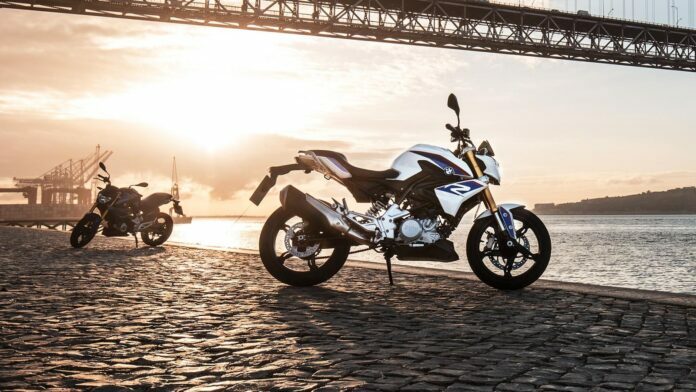 Therefore, the GS is one of the models that brings these two features together in a single bike. 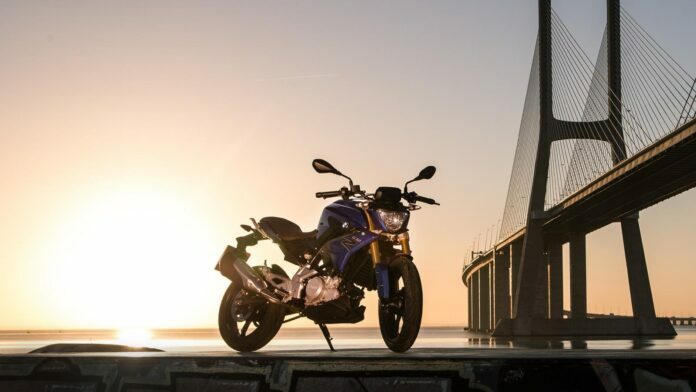 The other one is the Kawasaki Versys-X 300, which will be the direct competitor for the new BMW.